Georgia Sports Blog: Agent to Watch during the Coaching Search? Agent to Watch during the Coaching Search? Oh...and Carmony is a University of Georgia graduate. I've heard but not confirmed that he also currently represents Mark Richt's interests from an endorsement standpoint. Because of those connections and because he also represents Tom Izzo, Michigan State's uber successful coach, there have been rumors that UGA would try and talk to Izzo. Personally, I think we can talk to Izzo until we're blue in the face, but we're not pulling that dude out of MSU. I'd love to be wrong, but I think there's a very short list of folks that are out of reach. Guys like Donovan, Coach K, Roy Williams, Howland and yes....Izzo are out of our league right now. Regardless of how outrageously bullish I am about the short list rumors...I can recognize some reality. Separately, Sam Mitchell was rumored to have made contact with UGA last week about the opening. Maybe he's the second coming of Wooden, but I don't get why we'd consider a coach with only 1 career winning season in the NBA out of 4+, and a guy that has never recruited a kid in his life. Hopefully he's on the C list. That said...it'll be interesting to see if Carmony can get one of his guys into his alma mater. If Mitchell did contact us last week, as you suggest, I must ask if this is the type of man we want running our program, anyways. I mean, the axe hadn't even fallen on Felton yet, and he was inquiring about the job opening? That's pretty low, right there. If that's true, Felton might want to have some words with him...I know I would if somebody did that to me where I worked. We can do better than Mitchell. Period. End of story. I really like Tony Bennett out at Washington St. I know that he has no connections here, but he has a helluva pedigree and he is doing pretty well up there at a very young age. If we're going to talk to Tom Izzo, we might as well ask Phil Jackson if he's interested. There's no chance Izzo leaves to come to UGA. That'd be like Richt leaving UGA to go coach at Indiana. What do you know Chance??? Sam Mitchell = Sidney Lowe? I just moved to Raleigh last summer so I get an earful about Sidney Lowe from the State fans in my office. He was hired to replace Herb Sednak as much for his NBA experience as his NCSU background. Now, I know that Sam Mitchell is more pedigreed than Lowe was in the NBA, and I'm not sure he wouldn't be a good choice, but there are better fits out there than he is for us. I vote for the guy at Xavier whose name escapes me and I'm to lazy to look it up. Young, aggressive, good recruiter. On the rise. I like Reggie Theus. 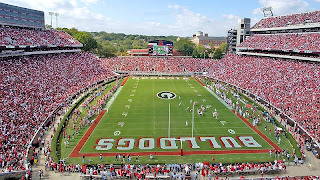 Being an assistant under Rick Petino, if he can motivate and teach his kids half of what Petino does, Georgia could be a power house in the SEC. Theus was also popular around here with media and fans. I think he'd be a good fit with Georgia. Bobby Knight?? Heck, Coach Wooden is still alive. tri guy: Sean Miller. And I agree with you. He's my top choice. Show him $2M per and pay the buyout. We do not, under any circumstances, want an NBA retread who has never coached successfully at the college level. No to Sam Mitchell. No to Reggie Theus (although the Jeri Curl was the bomb.com in its day). No to Mo Cheeks. We need someone with a proven track record of recruiting, motivating, developing, and graduating college kids. Even if it's only been for a couple of years, i.e. Brad Stevens or Anthony Grant. Remember that, while a "hot" name at the time, Billy Donovan was only at Marshall for a quick cup of coffee, and didn't exactly light the world on fire in his time there. No coach...I mean no coach is out of our league. A good coach lives by the Wayne Gretsky aphorism, "A good player knows where the puck is, a great player knows where the puck will be." The richest AD, with a new $30 million practice facility, in the most talent rich area in the country is where the "puck will be." Would any coach come here? No, but that is a function of comfort with their situation, not with seeing UGA as a step down. Those who think the UGA job is still a stepping stone job were not listening at the press conference and are still living in the Dooley AD days. I've got to agree with you. I think the DAWGS are ready to actually try to have a basketball PROGRAM at this point. We are a sleeping giant - we've got money, a new practice facility, a huge fan base, and some of the best recruiting in the country not 60 miles away. Not to mention the fact that if a coach comes to UGA and builds the program, that guy is a total hero: UGA's Dean Smith. Ask Tubby how popular he was when he was at UGA. I love the firing of Felton mid-season. It says Damon ain't puttin' up with mediocrity even if a guy gets lucky and wins some crazy games that end up in a championship. It means he's not looking for an excuse to settle. It means we're ready to FINALLY take that giant leap for DAWG-kind. If we're throwing out crazy names, what about John Calipari? Just back up a truckload of money to his house in Memphis. Gary Williams might be available soon. If we are talking to Izzo, does anybody know if Carmony represents Brian Gregory from Dayton. Gregory was an assistant for Izzo at MSU for a long time. He has done a nice job at Dayton. Izzo? Man, if that's even on a list in Damon's office, then I'll hand it to him. That would be a major-big-time hire. And even if he can't be got, and Damon tries anyway: that's the sign that he's taking the hoops program seriously. Don't forget: you can spend that ESPN money however you want. Michigan State ain't got it.